Napoleon Gold Coins – Where to Find Them Online? 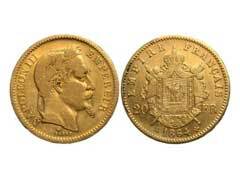 Napoleon gold coin is a collective term to describe old French gold coins that bear either Napoleon Bonaparte’s or Napoleon III’s profile on the face of coins. The very first batch of 20 franc Napoleon gold coins was minted in 1803, which became the absolute gold standard of coin making industry in Europe of that time period. Over the years seven different varieties of Napoleon gold coins were made that differed mainly by legend writing designs and modifications of Napoleons’ portraitures. Since the value of old French coins along with similarly old British coins remains high these days, there’s a high potential for online coin scams and fakes. In order to ensure you are getting a real thing for your hard earned money, buy exclusively from reputable online places. In our opinion, the best online place to acquire Napoleon gold coins pieces is eBay due to its excellent feedback system that allows buyers and sellers to rate each transaction according to their personal experience. If you buy eBay gold coins, you have a chance to check seller’s feedback prior to bidding on a coin. Most eBay sellers take their feedback scores very seriously and work very hard to provide the best customer satisfaction. Before placing your first bid, take care to carefully review information on old coins and their value to ensure you understand what you are actually bidding on and all transaction conditions. This will ensure your personal satisfaction and chances of landing a great piece for your coin collection. Should you encounter any discrepancies with your Napoleon gold coins upon their arrival, do not hesitate to contact an eBay seller to resolve a problem. Most eBay sellers with high feedback score are in the business of coin trading and not coin scams and will do everything in their power to accommodate your situation and issue a refund if all other measures fail.